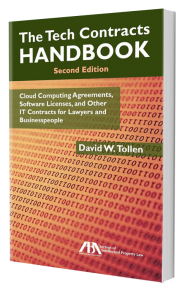 Lawyerist.com recently interviewed me on cloud computing agreements, and you can listen to the podcast at their site. Lawyerist focuses on the needs of small law firms, but the interview addresses the contracts most small businesses sign with their SaaS and other cloud vendors. In it, I discuss the negotiable versus non-negotiable contracts and the terms that matter most to small businesses. The microphone image in this post comes from Lawyerist and is used with their permission. Any trademark rights remain with Lawyerist.